﻿﻿﻿ Gearing up for the birthdays that I have late February, and March, I thought I better stay clean and stay fun! I often make a card, and immediately send it, this time I wanted to be able to make a few items and then have 'ready to send'. Today is no different. 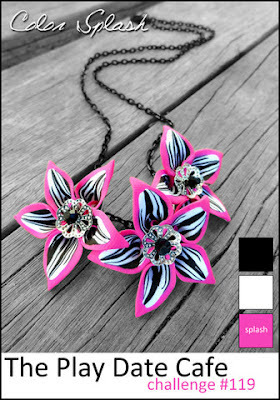 I used the Play Date Cafe Challenge with the black white and splash of HOT PINK, and it was sponsored by Twinery... they are fun! Its very useful no matter if you are making card, or box or food item!! I love the stem of the Fabulous Florets in black, on white. Using the 5 petal punch for the 3d flower in Melon Mambo can just pop! I have 7 layers of cardstock that I inserted a brad to and then crumpled them up towards the top and slowly allowed them to fall down as they dried. I hope you like! Simple and Clean! COme on over and play with the team at Play Date Cafe! I really like this card -very pretty. The flowers look so real! You made it with plain cardstock? Wow! 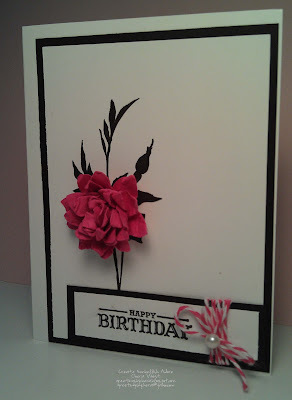 I absolutely love this card - so simple, but SO elegant!